Transitional in style this table is perfect for a home that is both elegant and casual. This round pedestal table with removable 18” leaf allows the table to expand from 42“ to 60” easily with a dual ratchet gear mechanism to accommodate additional guests when needed. 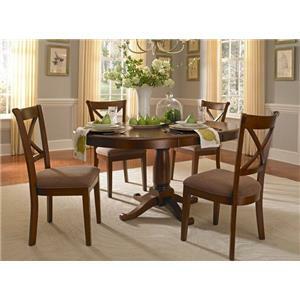 Surround this table with coordinating chairs for a complete, charming dining setting. The Desoto Transitional Oval Pedestal Table with 18 Inch Leaf by AAmerica at VanDrie Home Furnishings in the Cadillac, Traverse City, Big Rapids, Houghton Lake and Northern Michigan area. Product availability may vary. Contact us for the most current availability on this product. 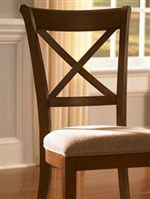 Create a charming and elegant dining room with this pedestal table and chair set. A nine-step process has been used to apply the Burnished Sienna and Distressed Black finish to give each piece a glowing look. 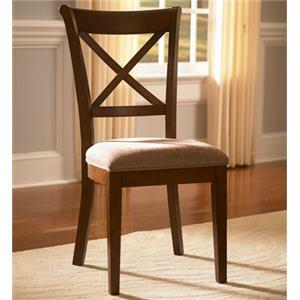 Chairs feature an X-back and ultra soft chenille upholstery to create the perfect blend of comfort and style. Solid wood construction will ensure a lifetimes worth of use and style for your home. The Desoto collection is a great option if you are looking for Transitional furniture in the Cadillac, Traverse City, Big Rapids, Houghton Lake and Northern Michigan area. Browse other items in the Desoto collection from VanDrie Home Furnishings in the Cadillac, Traverse City, Big Rapids, Houghton Lake and Northern Michigan area.